Join in for the season finale. 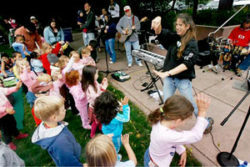 Dress up in costume and enjoy a free family Halloween party with the JAMband at The Park Chalet in Golden Gate park on Sunday, October 28, 2018. They’re hosting an epic Halloween JAM session, including a Halloween parade and a “Share Your Costume” experience where kids can come up to the mic and tell about their costumes. This one’s a costume party, so please consider coming properly attired, one and all.